Home » » Everton Vs Arsenal Match Report and Twitter tweet. Everton Vs Arsenal Match Report and Twitter tweet. Arsenal failed to regain the third spot after a poor showing against Everton on Sunday. The Toffees took three points, thanks to an early goal from skipper Phil Jagielka. The 1-0 loss means that the Gunners trail Spurs on the table. Everton started off the game brightly with Sigurdsson and Andre Gomes dominating the possession in the midfield. The Toffees didn’t take long to open the scoring as Arsenal made a mess of Lucas Digne’s throw in before skipper Phil Jagielka tucked home from close range. Replays showed that Digne’s foot had crossed the line during his throw-in but the referee missed it and the goal stood. Arsenal’s hope of their first clean sheet away from home was down the drain yet again. Everton bossed the midfield battle as Idrissa Gueye’s presence proved to be a massive block as Arsenal tried to create chances. Henrik Mkhitaryan and Mesut Ozil were given very little time and space on the ball and the Gunners’ creative outlet was nullified. Dominic Calvert-Lewin proved to be a menace for both Shkodran Mustafi and Sokratis Papastathopoulos and the young forward kept both of them busy. Richarlison gave Nacho Monreal a horrid team on the right flank and the Spaniard struggled to contain the relentless Brazilian. Gylfi Sigurdsson had a chance from outside the box in the 37th minute but his right-footed strike was hit straight at Leno. The Toffees had another chance at the end of the half as Richarlison was released on the right flank by the Iceland international but his cross was brilliantly blocked by Sokratis. The Gunners failed to have a single shot at Jordan Pickford’s goal in the first half as Everton went in to the break with a well-deserved 1-0 lead. 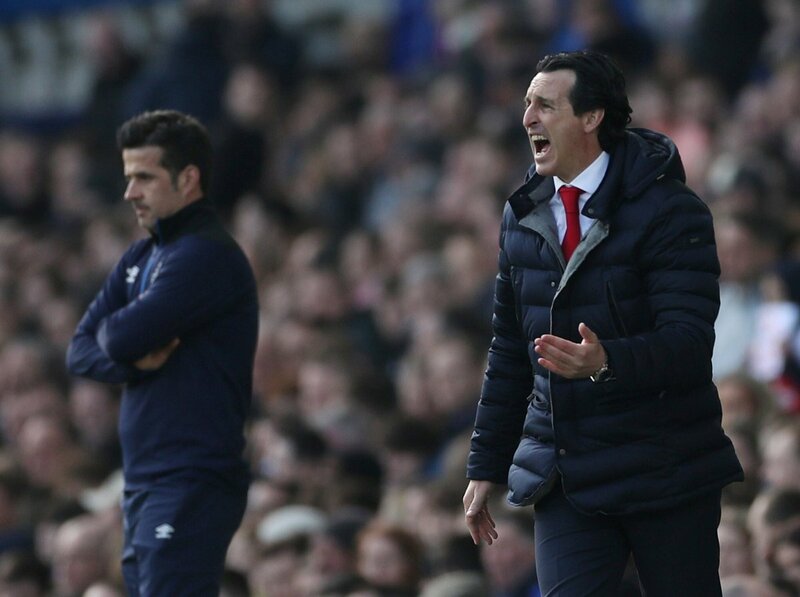 Unai Emery was far from happy with his side’s first-half performance as he brought on Aaron Ramsey and Pierre-Emerick Aubameyang in place of Mohamed Elneny and Sead Kolasinac. The change in shape swayed the momentum in Arsenal’s way as Aaron Ramsey got a lot of time on the ball. The Welshman had the first chance of the game after a horrible clearance from Pickford fell to his feet but his shot went over. Arsenal’s dominance barely lasted for 10 minutes as Everton started to take control of the game. Everton’s first chance of the half fell to Sigurdsson from 30 yeard out but the number 10’s shot sailed over the bar. Shkodran Mustafi’s long ball was headed by Lacazette but the Frenchman failed to generate any power behind it. The Toffees had a golden chance to double their lead as Maitland-Niles’ header back to Leno fell into the path of Bernard but his shot was saved well by the Arsenal goalkeeper. Richarlison and Coleman combined brilliantly on the right flank but the Brazilian found himself in an offside position. Mkhitaryan came the closest to level the game for Arsenal but his right-footed curler from outside the box went inches wide. Richarlison was again involved on the right wing as his cross found Sigurdsson in the box but the Icelander shot straight at Leno. Sigurdsson was at it again but his blocked shot fell into the path of Richarlison who shot wide. Arsenal made their final substitution as Alex Iwobi replaced Mesut Ozil for the final 15 minutes of the game. 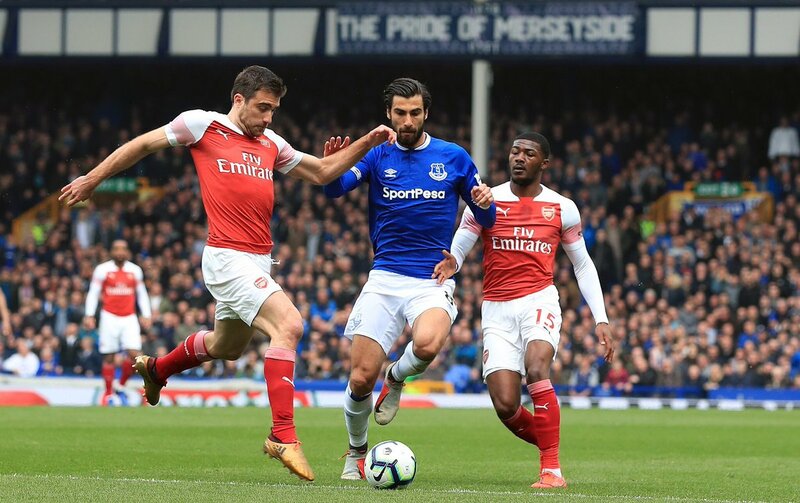 The Nigerian’s pace and trickery brought some much-needed penetration to Arsenal’s game but it wasn’t enough as Everton held on to take a well-deserved 3 points. Arsenal will complain about the decision to allow the foul throw but Unai Emery’s side could not create anything to claim 3 points. Final score; Everton 1 - Arsenal 0. Spineless display. Emery got it all wrong again away from home, the players went through the motions without breaking sweat, and with 4 away games still to play, we have no chance of making the Top 4. If Mkhitaryan is a better option than Özil in Emery’s eyes then we really don’t deserve Mesut Özil. Mkhitaryan has been one of the worst players on the pitch constantly losing possession and offering us nothing. I can’t believe he stayed on. I can remember worse examples of single matches ruined by bad refs, but I can't remember any other season where the referees have been this consistently terrible. Referee cost Arsenal the game.